Repair dry rot in the floor around toilet. Because of leaky toilet seals, pest inspectors often find dry rot in the subflooring beneath the toilet area. Cost to repair this type of damage will vary greatly depending on the extent of the damage and the type of flooring. In this case, the damage was limited to the corner of the floor between the water closet and the tub. 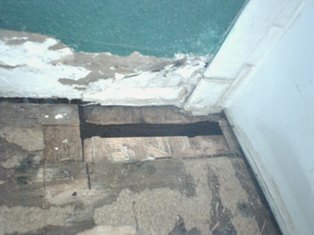 The picture above shows the work in process with damaged subfloor removed. Once the floor joists were inspected and found to be in sound condition new subflooring was installed. The original vinyl flooring was then glued back down and the toilet re-installed. I have a mobile home repair job bath room bedroom and kitchen area all have soft spots in the floor with linolium and carpet. Spots are small so Ill have to replace each one separately. What would be the estimated time and cost? Moderator: You won’t know what the condition of the sub-flooring and floor joists will be until your nose is in the floor. How much should I charge to replace plywood floor and vinyl fiooring in a 9’x 8′ kitchen in a mobile home where fridge and dishwasher and oven need to be removed to do repair? Moderator Comments: When in doubt, charge by the hour. This type of job is always hard to estimate since more damage may be revealed as you dig further into the floor. I am planning on selling my house. Single story with an average crawl space. A home inspector found dry rot under the floor in the bathroom area. It needs to be repaired. The bathroom flooring is tile so I don’t think it will be to easy. The toilet needs to be removed and he said the rot goes under the tub. Help!! How much should I budget to have the tile flooring removed and the sub floor replaced/repaired. I don’t have a picture to send you. Moderator Comments:This is one of those situations that every homeowner dreads. The problem is that you can’t really estimate the cost until you see the actual damage, and you can’t get a good look at the damage until you tear up the flooring. Anytime you’re dealing with dry rot the repair involves exposing the affected area, removing the damaged members and the replacement with new materials. More difficult than new construction, the contractor is often working in tight places with limited access in an attempt to minimize the impact on the good surrounding environment. The cost can be high. Because the dry rot extends under the tub this is probably a good time to consider a full remodel on the bathroom. As always, get several quotes and make sure that the contractor is licensed, bonded and insured. Depends on whose buying the new tiles. Demolition of the old floor maybe quick but reveal additional issues. I would look to charge a minimum of $300 without materials. If it’s basic it should be a short days work. Sub floor around toilet seat rotted. I removed toilet, removed tiles around toilet to see how bad it is. Looks like it is about 3×3 area rotted. Floor beyond that area look fine. How much will it cost to replace the 3×3 damaged subfloor, replace tile, reseat toilet? And should I call a bathroom remodeling co? The area around the toilet is rotten. I would guess about 4’x4′. My husband had planned on doing it but he got sick at the beginning of the year and died in April, 2015. He was always my handyman. I need an estimate. It needs to be fixed. Hope to hear from you. I have another area in my bedroom to look at. It feels soft in spots. Also the faucet in the kitchen. Please use this link to request an estimate from a handyman in your area…request an estimate. I have a bathroom in an older model duplex that has an extremely weaken area around the bathtub and the toilet. The bathroom size is roughly about 9×8. The area that is technically damaged is about 4×4. When sitting in the bathtub I feel dizzy as if the floor is about to give way. So I know some joists are damaged and need replacing as well. My husband is doing the repairs himself and we have no idea on what to charge our landlord for the time and work. She will supply the materials. I have an area of dry rot around my toilet about a 3×3 area. I am located in Summerville, SC and am looking for a handyman to give me an estimate. How do I find handymen? I need this bathroom fixed. I just want the subfloor fixed and the toilet replaced. I will be getting new flooring but will install that myself. What is the cost of removing and replacing an exterior outside of barn wall sliding barn door with a newly fabricated 5/4″ x 6″ boards and including new sliding barn door hardware? Not including the sealant (exterior latex paint). This would also have a 26″ door inset so that one could pass through without sliding the door to open. The size is 12 foot x 6 foot x 2 doors total..
Dry rot around toilet need estimate. What is a fair price for the cost of labor only? To Repair/Rebuild – Manufacture home Freestanding wood porch with Aluminum hand railing. Porch walking platform has dry rot and steps have termites. Size 23.5 x 6 Feet / 141 SF 4 steps / stairs. Our handyman offered to do the job at a lower price of a contractor. I shopped and paid for all supplies and materials. I have a leak in my upstairstoilet, the wood under the toilet has rotted and there is a water stain starting to mold coming through the kitchen ceiling. I am in Dayton, OH.